In mid October, police in New York City announced that they had solved the mystery of the “Baby Hope” case: at last, they had the killer of a four-year-old child whose body had been found in 1991, 22 years ago. And the accused killer, Conrado Juarez, had confessed. The accused may have been telling the truth when he said he killed the victim, or when he said that he actually didn’t. I certainly don’t know the answer to that. But one thing that would help to resolve the question would be a video and audio recording of the entire interrogation, from start to finish. A judge or jury could then look at the entire thing and decide whether the accused was coerced or not. And over a year ago, NYPD Commissioner Ray Kelly announced that, after a long pilot project, the NYPD would begin recording all interrogations in homicide, felony assault, and sexual assault cases. But in this case, that was not done. Instead, a recording of only the confession itself — a statement of guilt by Juarez at the end of the process — was made. No recording was made of the questioning that lead up to it. So we have no record of how police got to the point of getting the admission of guilt. And that leaves the confession in dispute: the accused will argue that he was coerced, and the police will say they did nothing to coerce him. But there will be no recording for a judge or jury to see. Or maybe it’s something else else. According to Michael Palladino, the head of the NYPD’s detectives union, it’s better if interrogations don’t get recorded. “There are certain tricks of the trade, I should say, that I think should not play out in front of the jury.” But the cost of hiding these “tricks” is that we now have uncertainty in the Baby Hope case. And, after so many cases of wrongful convictions including false confessions — they show up in 25 percent of all DNA-based exonerations — there is a loss of public confidence. Here’s hoping that things move faster as the NYPD transitions to the recording of confessions. Assuming that they have the real killer of Baby Hope, we all want the guy off the street. We don’t need uncertainty introduced because there’s resistance to recording. According to a new study by researchers at Florida International University, the use of standard interrogation techniques can prompt false confessions by juveniles; the risk is higher with juveniles than with adults. In the present study, we examined (a) the prevalence and characteristics of youths’ true and false admissions (confessions and guilty pleas), (b) youths’ interrogation experiences with police and lawyers, and (c) whether youths’ interrogation experiences serve as situational risk factors for true and false admissions. We interviewed 193 14- to 17-year-old males (M = 16.4) incarcerated for serious crimes. Over 1/3 of the sample (35.2%) claimed to have made a false admission to legal authorities (17.1% false confession; 18.1% false guilty plea), and 2/3 claimed to have made a true admission (28.5% true confession; 37.3% true guilty plea). The majority of youth said that they had experienced high-pressure interrogations (e.g., threats), especially with police officers. Youth who mentioned experiencing “police refusals” (e.g., of a break to rest) were more likely to report having made both true and false confessions to police, whereas only false confessions were associated with claims of long interrogations (>2 hr) and being questioned in the presence of a friend. The number of self-reported high-pressure lawyer tactics was associated with false, but not true, guilty pleas. You can see the full abstract here. The study supplies yet another set of reasons to examine carefully our interrogation practices, to give up on interrogation for the purpose of getting a confession (instead, use the UK’s PEACE method), and to record all interrogation as a precondition to using them in court. 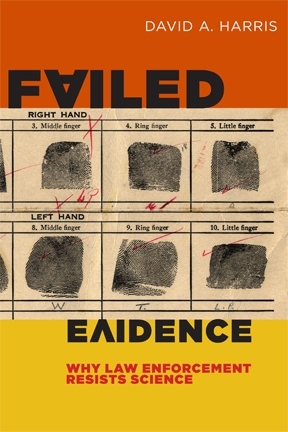 “Failed Evidence” Event in Chicago, Wed. October 16, 5 p.m.
For those in the Chicago area, I’ll be speaking about my book “Failed Evidence: Why Law Enforcement Resists Science” on Wednesday, October 16, at 5 p.m. at Gage Gallery, 18 S. Michigan Avenue. The event is free and open to the public. The event is sponsored by Roosevelt University’s Joseph Loundy Human Rights Project, and is part of their annual speaker series. The link to the event is here. The next public event for “Failed Evidence” will be in Pittsburgh on November 6, at noon at the Harvard Yale Princeton Club, 619 William Penn Place, The talk will be sponsored by the Allegheny County Bar Association and the Pitt Law Alumni Association. More details to follow. Of the 311 cases of wrongful convictions documented by The Innocence Project, about 25 percent include a false confession or false statement of guilt. Yet false confessions remain the least understood type of justice system error. Most people still ask, “why would anyone confess to a serious crime he did not commit, without physical abuse, a mental handicap or lack of sobriety? I know I would never do that.” Twenty years ago, I would have said the same thing. A very brief summary, without giving anything away: A Washington, D.C. detective investigating a murder participated in the interrogation of the main suspect. The woman denies any involvement at first, but after seventeen hours of questioning, she finally admits to participating in the crime, and supplies many incriminating details. After the suspect is charged but before her case goes to trial, follow up investigation by police causes the case to fall apart, and a judge orders her released from jail after nine months. The case is never solved. Some years later, the same detective is assigned to a cold case unit, and he begins to look into the case again by watching a video tape of the interrogation. What he sees reveals what went wrong, and it lays out an incredible lesson in exactly how the false confessions come to be. And we learn that the video tape recording of the full interrogation was actually made just by chance; in the usual course of things, there would have been no recording, and none of this would have been discovered. For anyone interested in police interrogation, for anyone still asking how an innocent person could ever confess, I cannot recommend this program more highly. And it’s yet another endorsement of the idea that we must record interrogations if we are ever to solve this problem.